Bangalore, June 30th, 2014: BGS Global Hospitals, Super Specialty Tertiary Care, on the eve of doctor’s day, organized a press conference on the 1st Successful Combined Dual Organ (Liver and Kidney) Transplantation procedure in Karnataka. The dual organ transplantation was performed by a team multi organ transplant surgeons, Dr. Mathew Jacob, Dr. Sonal Asthana, Dr. Rajiv Lochan & clinically supported by Dr. Kaiser Raja, Consultant, Hepatalogist, Dr. Anil Kumar, Consultant, Nephrologist, at BGS Global Hospitals. The transplant recipient is a practising orthopaedic specialist, Dr.Sanjiv Kumar Sinha, a 59 year old who was suffering from long standing diabetes, which lead to his liver cirrhosis and kidney failure. 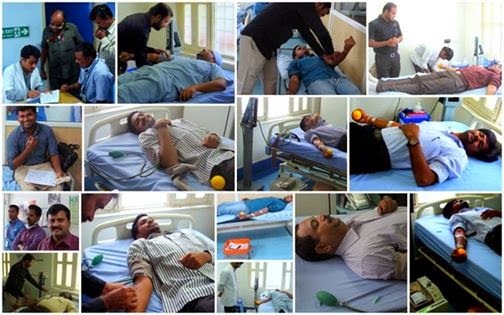 He had been on renal dialysis for many months prior to consultation at our Transplant centre. Whilst awaiting transplantation he unfortunately fell at home and fractured his hip and had to undergo total hip replacement surgery. In April 2014 the family of a brain dead donor who had unfortunately met with a fatal accident came forward to donate the organs of their loved one. The organs were allocated by ZCCK (Zonal coordination committee for Karnataka) to Dr Sinha as they were found to be a suitable match. He subsequently underwent Combined Dual Organ (Liver and Kidney) Transplantation and is currently doing well. 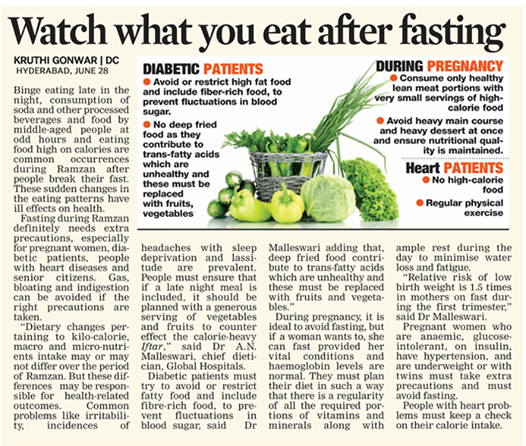 Dr. Kaiser Raja, Consultant, Hepatologist, BGS Global Hospitals, said, “Having combined Liver & Kidney failure is a very serious condition in which survival is limited to a few months. Dual organ transplantation is a much more complex procedure which requires coordination amongst a large number of highly skilled super specialists"
Mycotic pseudo aneurysms of the carotid artery - Carotid bypass surgery with removal of the pseudo aneurysms. Chennai, 26th June 2014: Surgeons of the Institute of Neurosciences and - Surgeons of the Institute of Neurosciences and Spinal Disorders recently performed a rare, complex and critical surgery, which effectively restored blood supply to the brain. Mr Srinivasan presented to our doctors in the Emergency department in a state of drowsiness, sepsis with a large pulsating mass on the left side of the neck which was pressing the windpipe and causing breathing difficulty. His scans showed that both carotid arteries were affected by infection: the right was blocked and the left side was weakened causing multiple aneurysms one of which had burst. Dr Sridhar Chief Brain and Spine Surgeon Global Health City Chennai said " State of the art monitoring of critically Ill neuro patients along with modern surgical methods allow surgeons to successfully perform challenging and critical cases with razor edge precision "
Chennai, 13th June 2014 Global Health City has organized a Basic Life Support (BLS) Training programme for the neighborhood driver Community (Auto drivers, Cab / Call taxi drivers and Ambulance drivers) of the neighborhood areas. More than 500 auto, cab drivers participated in the training program. Road accident rate in our country is climbing constantly; it has reached an alarming 51.8% in 2012. When it comes to Road Traffic Accidents the driver communities in most cases are the first ones to swiftly respond and carry the injured to a nearby hospital. BLS training program will sensitize them about the significance of GOLDEN HOUR in road accident, cardiac, brain, liver emergency and help them in safe evacuation of the victim. Eminent doctor Dr. K.R. 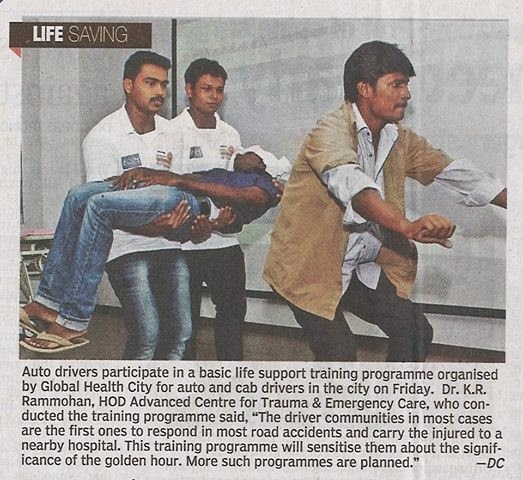 Rammohan - HOD Advanced Centre for Trauma & Emergency Care, conducted the training program. “We come across many fatalities due to road traffic accidents, which clearly indicate lack of awareness on immediate responses during the medical emergencies. To address those issues, we have launched this campaign UDANE GLOBAL to raise awareness for swift response during critical medical emergencies” said Dr. Rammohan on the training session. BGS Global Hospitals launches ‘STHREE’ - Making cancer care tolerable - A breast cancer patient survivor connect programme. ‘STHREE’, a corporate social responsibility initiative to connect cancer patients to cancer survivors. It is a support group to heal, restore, empower and energize those patients who are undergoing treatment for breast cancer. ‘Sthree’ was launched on 14 June'14 by Smt Umashree, Honorable Minister of State for Woman and Child Development, Government of Karnataka who was the Chief Guest. Mrs Malini Krishna Murthy, IPS, IGP- Karnataka State Reserve Police was also present. 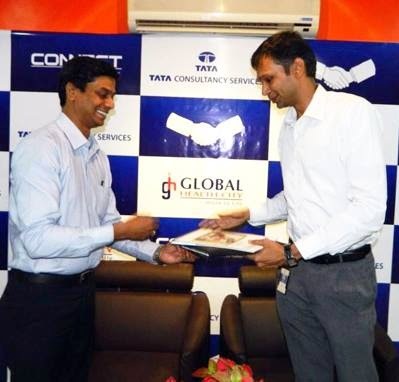 Global Health City, Chennai and Tata Consultancy Services (TCS) have entered into a Memorandum of Understanding (MoU), on May 12, 2014 as their privileged Health Care Partner.